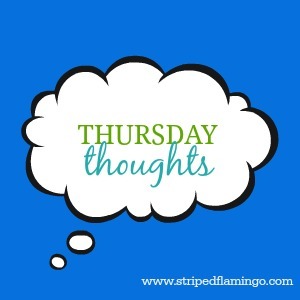 The Striped Flamingo: Join Me for a Weekly Linkup - Thursday Thoughts! Join Me for a Weekly Linkup - Thursday Thoughts! I've been thinking about hosting a weekly link up for a long time. I love linking up with other blogs so why not host my own?! But it's hard when a lot of them are themed because my writing inspo doesn't always tie in. What: Blog about anything! As long as it is your thoughts/musings/ramblings/ideas, go for it! Why: To find more awesome blogs to read. And to interact more with other cool bloggers. Where: Here on TSF (www.stripedflamingo.com). 2. I'd pretty much decided that I wanted to stain (not paint) my cabinets until M gave me the bad news that only the fronts are real wood. Sigh. Back to the drawing board. However, Ikea has a different idea as to what kitchens in the future will look like. 3. HAHA, these ridiculous captions on photos of the British royal family had me snickering at work. 4. Isn't this the truth? !